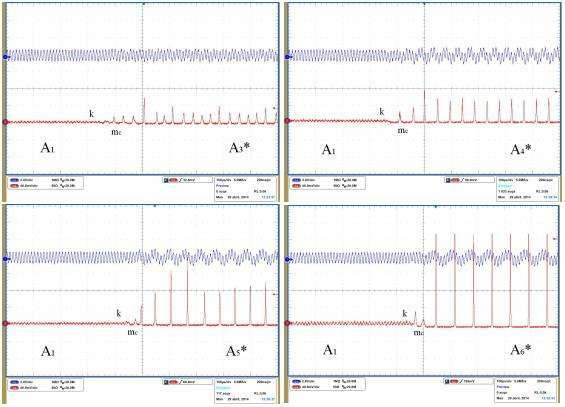 Oscilloscope traces showing selection of any periodic orbit in a multi-stable fiber laser. The original period-1 orbit (A1) is converted into a period-3 (A3*), 4 (A4*), 5 (A5*) or 6 (A6*) orbit after application of the control force with feedback strength k and modulation amplitude mc. Multi-stability, or coexistence of multiple behaviors, is a universal phenomenon found in almost all areas of science in nature, from lasers and chemical reactions to climate or the brain. The phenomenon of multi-stability also contributes to fundamental dynamics of neurons and neural networks related to cell diversification. Multi-stability has been proposed as a basic mechanism for storing associative memory and pattern recognition in the brain. In the case of perception of ambiguous images, different cognitive brain states represent particular objects, which can be selected by the neural network to give some input information depending on prior knowledge. The possibility of converting a multi-stable system into a monostable one is important in modern engineering and laser technologies, where a stable, predictable output robust to noise and sudden changes in parameters is required. Multi-stability is key not only in different areas of science and engineering, but also in medicine. It is believed that serious diseases such as epilepsy and cardiac arrhythmia are caused by the coexistence of normal and pathological behaviors. In search of solutions to this problem, scientists have designed a method of controlling multi-stability capable of removing all coexisting states, preserving a behavior with desired properties. This new technique involves the selection of a particular behavior through parametric modulation with a frequency near the frequency of a desired state. Furthermore, by applying positive feedback at the same parameter, all unwanted states can be annihilated. The developed method has been tested with both periodic and chaotic systems and verified experimentally in a fiber laser. One of the main advantages of this type of control is its ease of practical application. Even without prior knowledge of the system dynamics, you can select a desired behavior simultaneously organizing a positive feedback and sweeping frequency of a signal generator. The method has great technological potential for generating high-energy laser pulses, as well as important applications in medicine, for example, in designing a pacemaker to stabilize heart rate at a desired frequency. The work is published in Proceedings of the Royal Society A.